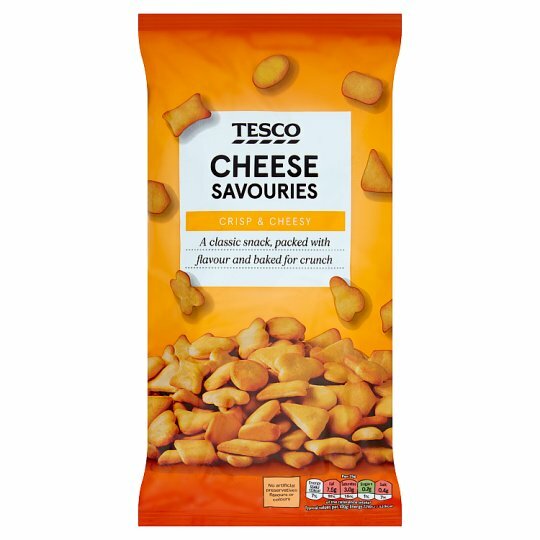 CRISP & CHEESY A classic snack, packed with flavour and baked for crunch. Our bakers have over 100 years of baking knowledge, passed down from generation to generation. They create both new and classic recipes at our bakery in southern England, evolving them over time and making them the best they can be. INGREDIENTS: Wheat Flour (Wheat Flour, Calcium Carbonate, Iron, Niacin, Thiamin), Palm Oil, Cheese Powder (Milk) (10%), Sunflower Oil, Yeast Autolysate, Sugar, Glucose Syrup, Malted Barley Extract, Raising Agents (Ammonium Bicarbonate, Sodium Bicarbonate), Salt, Whey Powder (Milk), Lactic Acid, Flavouring, Water. For allergens, including cereals containing gluten, see ingredients in bold. Also, may contain soya.